Geoscience Research Institute | Is There Design in Nature? The existence in living organisms of features that function like mechanical devices to achieve some purpose are evidence they were created by a Designer. "O Lord our Lord, how majestic is your name in all the Earth." Paul probably makes the strongest statement in Romans 1:19,20, where he claims that the evidence of God in nature is so clear that no one has an excuse for denying His existence and sovereignty. Charles Darwin is generally credited with destroying Paley's argument. However, Darwin was unwilling to blame God for all the evil in nature. He stated that he could not believe in a God that made cats to play with mice, or that designed tiny wasps to eat out the insides of a caterpillar. Darwin explained the evil in nature by postulating that God was so far removed from nature that He did not intervene and was not responsible for the state of nature. Instead, nature operated according to its own inherent principles. Those individuals that had some advantage simply out-competed those that lacked the advantage. This process is called natural selection. Successive generations of competition gradually resulted in organisms with greater complexity and increasing ability to compete. Thus there is no need to suppose that God actually designed the tiniest details of living creatures. Darwin would rather have God good but in the distance than close to us and evil. Most of us would probably agree. But was Darwin's argument valid? Darwin claimed he could find no such cases, but others have made the opposite claim. Some scientists have recently presented examples which they believe refute Darwin's assertion. Michael Behe of Ohio is one of the leaders in opposing Darwin's claim of gradual development of all complex organs. He bases his argument on what he calls "irreducible complexity." This term refers to a system that is composed of numerous interrelated parts that are so arranged that if any one of them is absent, the system falls apart and has no value whatsoever. Such a system could not be favored by natural selection as it developed gradually, because there is nothing to work with unless the entire system is in place, simultaneously. If an organ can be found that is irreducibly complex, then Darwin's argument fails, and, according to his own words, his theory would "absolutely break down." Living organisms exhibit features that have such complex interdependency of parts that an open-minded observer will recognize them as the product of an intelligent creator. What is the response of evolutionists to the claim of irreducible complexity in living organisms? I have observed two responses. One is simply to state that our inability to imagine a solution to the problem does not mean that the problem has no solution. The other is to assert that the organ can indeed be constructed in gradual steps, each of which has a function. The first argument presents no evidence in support of its conclusion; hence any weight it carries is philosophical, not scientific. The second argument must be evaluated in its own context, depending on the particular example under discussion. Some features of living organisms undoubtedly could arise in gradual steps, assuming the process was being intelligently guided. It seems highly unlikely that any organ could be created by random processes, although those with a philosophical commitment to such explanations will assert that it is possible. One result of the argument from perfection is that it shifts the burden of proof back where it belongs- with those who make the claim that all organs can arise in gradual steps. One should not be expected to believe a statement that is not supported by any evidence merely because the statement cannot be disproved. There is another type of argument for design. Some circumstances seem so unexpected that one suspects there must be something more than chance involved. Most scientists are willing to attribute a result to chance if it could be expected to occur more often than 5 times in 100 trials. Some scientists will lower the acceptable odds to one chance in 1000 trials, depending on the nature of the event. But there are limits to what anyone will accept as the result of chance. If the probability of an event is exceedingly low, it is reasonable to suppose that it did not happen as a result of chance. If the event also seems to have a purpose, it is reasonable to suppose that the event was guided by an intelligent mind, whether good or evil. A couple examples of design in nature could be described. Two examples are described below, one based on the argument from improbability and one based on the argument from irreducible complexity. Example 1. The Earth differs from other planets in ways that permit life to exist. If any of these conditions were not present, life as we know it could not exist on Earth. For example, Earth's atmospheric composition is unique among planets in our solar system. Carbon dioxide dominates the atmospheres of the other close planets, with little oxygen or nitrogen. The opposite condition occurs on Earth, making it possible for life to exist on Earth but not on the other planets. This is another example of an argument from improbability. The rather precise conditions of temperature range, moisture, atmospheric composition, etc., seem most reasonably explained as the result of design rather than chance, even though we do not have enough information to calculate probabilities. Example 2. The cilium (pl. cilia) is a microscopic, hair-like structure that is part of a cell. Cilia wave back and forth rapidly, moving either themselves or the medium around them. Certain protozoa use cilia for locomotion through water, in a fashion analogous to oars on a boat. Cilia line the respiratory tracts of mammals, where their motion moves foreign particles upward toward the mouth. 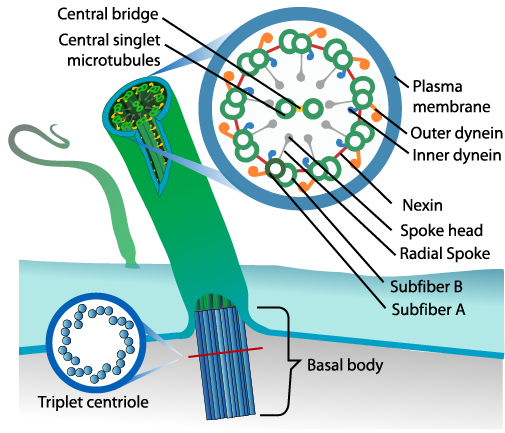 A cilium consists of a bundle of microtubules held together in a special way. The microtubules are made of a molecule called tubulin. The microtubules are linked together by a stretchy molecule called nexin. Molecules of a protein called dynein extend between microtubules. One end of the dynein molecule holds fast to one microtubule while the other end walks up an adjacent microtubule. The microtubules would slide past each other, but are prevented by the nexin connections. The resulting tension causes the cilium to bend. Removal of the tubulin would destroy the cilium. Removal of the nexin would cause the cilium to fall apart. Removal of the dynein would destroy the ability to move. These three proteins form an irreducibly complex system. Intelligent design is the best explanation for such systems. In reality, a cilium contains at least two hundred different types of molecules. Some of these molecules might not be required, or could be added one at a time. It is not necessary that the irreducible complexity of the cilium extend to every type of molecule. If any part of it is irreducibly complex, it violates Darwin's hypothesis, and is evidence of design. The "argument from design" was widely ignored in the century after Darwin, in part because our knowledge of living systems was so incomplete that the gaps could only be filled in with imagination. As biological knowledge has increased, the argument from design has been revived and expressed in a more sophisticated way as the "argument from perfection." Nature truly appears to be designed. Some patterns may be produced by mechanisms that do not require any special divine intervention, but this does not remove the basis of the argument in other examples. Some features are claimed to be suboptimal, but this does not mean they are suboptimal, or that they were not designed. Neither does the argument explain the origin of the pattern. The presence of evil in nature does not mean there is no designer either. There may be both good and evil designers at work in nature. The existence of certain features that could not survive in intermediate stages is evidence of a designer. Furthermore, it seems to me to be evidence of a supernatural Designer who created by special intervention -- creation -- and not through a continuous process such as evolution. I see the argument from perfection as an argument in support of an interventionist, discontinuous creation. "The heavens are telling the glory of God; and the firmament proclaims His handiwork. ... Their voice goes out through all the earth, and their words to the end of the world."